You’ve learnt about the technology behind what lights up your life, now’s time to learn about the aesthetics and characteristics of the plethora of fixtures available on the market. Today us at the Space Shack are here to give you the 411 on what you might come across. Most common in older homes these are the standard fixtures you’ll find flooding a room. Simple in design, they sit in the centre of the ceiling providing relatively poor lighting for any daily tasks. They typically fit standard bayonet or Edison bulbs, so you will find yourself only buying incandescent, fluorescent or LED bulbs. They can easily be replaced and switched to a pendent, track light or a chandelier. A surface mounted fixture's distant cousin - track lights are standard box fixtures attached to the ceiling circuit which supplies power to the track. Lights on a track can be repositioned and are attached to the track. They’re a great way of spread light- ing across a room when you’re stuck with a single middle ceiling fixture. If you do have a chance to reposition your ceiling fixtures, try framing the perimeter of a room for maximum ambience! You’ll typically find yourself using incandescent or halogen bulbs. Track lighting in our London Make-Up Academy renovation. Often referred to as spot lights or cat eyes, these are small fixtures ranging in size from 50mm - 150mm in diameter. They give off a hard light, however, several can be placed in a single area to achieve a subtle transition. These fixtures sit flush against the ceiling, which makes them perfect if you have low ceilings or live in a loft apartment. 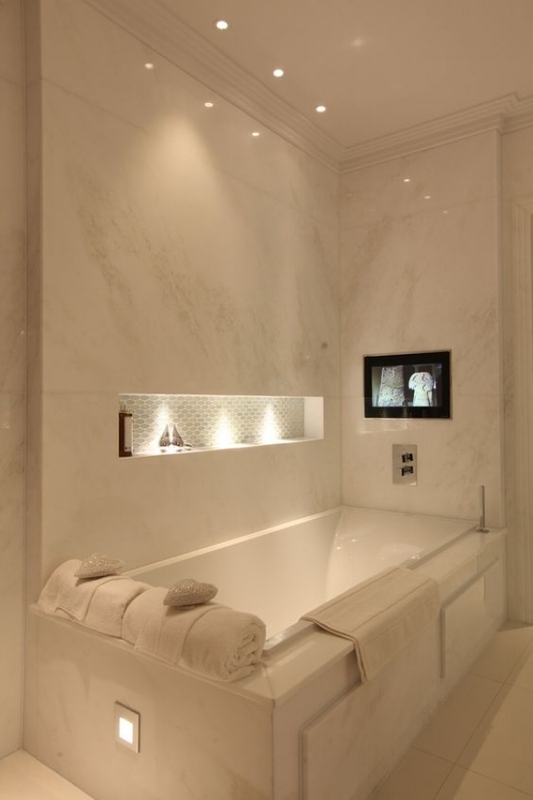 Recessed fixtures typically cost a lot more than standard lamps, however they can be less expensive to run. There are many more retro fit LED products made for recessed lighting fixtures, giving you more variety. They comprise of the housing (which is the fixture) and a trim which can come in many different decorative styles. Low voltage halogen recessed lights in our East London kitchen extension provided a warm white light. Much like ceiling lighting, wall lights come with recessed fixtures. They’re essentially the same thing. They can be used to mark a path or add subtle hues to the lower proportion of a room. Floor lighting strictly uses solely LEDs due to heat and re risks. Definitely overlooked. Lamps have so much potential to completely change a room without breaking the bank or the wall! The scale can range from simply being sat on a bedside table, floor lamps to wall mounted lamps. Lamps can provide hard lighting with a bare bulb or one can gain control of the ambience with decorative shades. Want to subtly make a room look more interesting? Try stashing some lighting fixtures in spaces you might not have even thought of ever utilising. Under or on top of cabinets, around thick door frames, under step risers or even under your desk! You’ll have so much fun experimenting - we definitely have! The sky's the limit as they say. You’ll have to stick to LED or fluorescent lights however, as most of these tight spaces require low heat or you’ll have a safety risk! Now it’s your turn to apply what you’ve learnt and give your home the Space Shack treatment!